Laxey Mine is well known for "The Lady Isabella" waterwheel at the foot of Snaefell Mountain in the steep sided glen of the River Mooar. 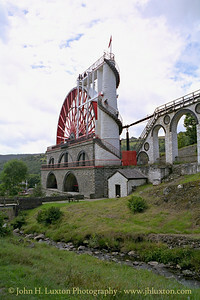 The mine is unique due to the ingenious use of the river to supply all the plant with continuous 'free energy' is represents one of the most important sites of the industrial revolution in the British Isles. 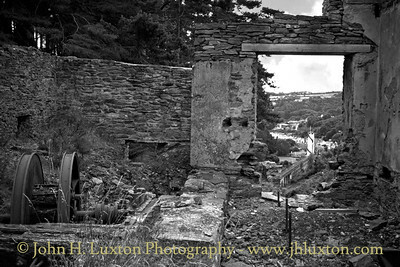 Running for more than a mile in a north south direction from the washing floors of lower Laxey to the village of Agneash, the mine was the workplace of five hundred men. Reaching a depth of more than three hundred fathoms, the mine produced one fifth of the total British output of zinc in the 1870’s along with a massive turnover of lead and a significant supply of copper. 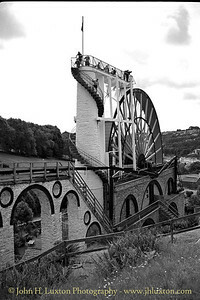 View from Engine Shaft down the flat rod viaduct to the LADY ISABELLA waterwheel. 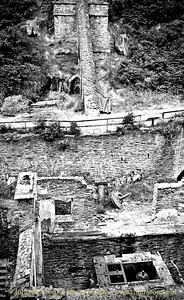 The remains of the Machine House and pipe which supplied water to the turbine in the basement of the building. 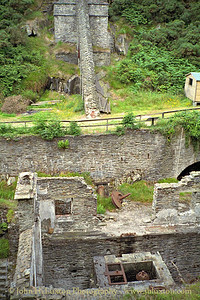 The remains of the Welsh Shaft winding drum can be seen. Interior of the Engine House with the remains of the winding drum which hauled kibbles of ore from the Engine Shaft. 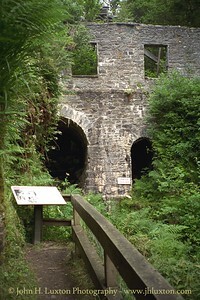 The LADY ISABELLA waterwheel and the flat rod duct can be seen in the distance. The Compressor House built in 1880 to provide compressed air to power the rock drills. 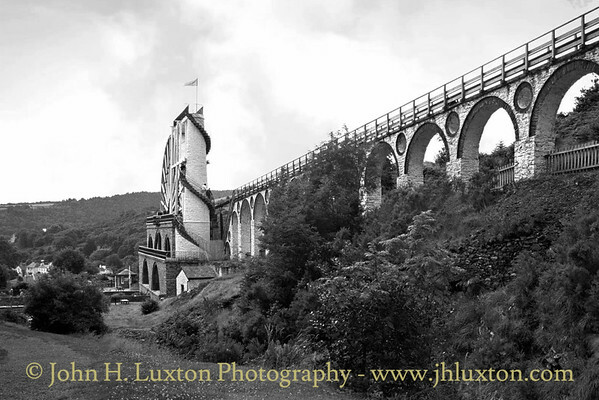 The Laxey Wheel (also known as Lady Isabella) is a large waterwheel built into the hillside above the village of Laxey in the Isle of Man. Designed by Robert Casement, the wheel has a 72-foot-6-inch (22.1 m) diameter, is 6 feet (1.8 m) wide and revolves at approximately three revolutions per minute. 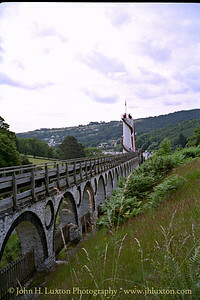 It was built in 1854 to pump water from the Glen Mooar part of the Great Laxey Mines industrial complex. Named "Lady Isabella" after the wife of Lieutenant Governor Charles Hope, who was the island's governor at that time. The wheel is currently maintained by Manx National Heritage as part of the Great Laxey Wheel & Mines Trail. 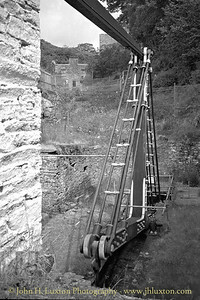 The 'T' rocker bob, transfers the horizonta motion from the flat rod powered by the LADY ISABELLA water wheel to vertical motion to operate the pump rod in Engine Shaft. 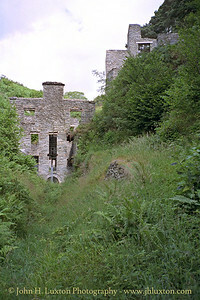 The Machine House with Engine House above. The engine house accommodated the steam engine which powered the pump before the Lady Isabella waterwheel was constructed. 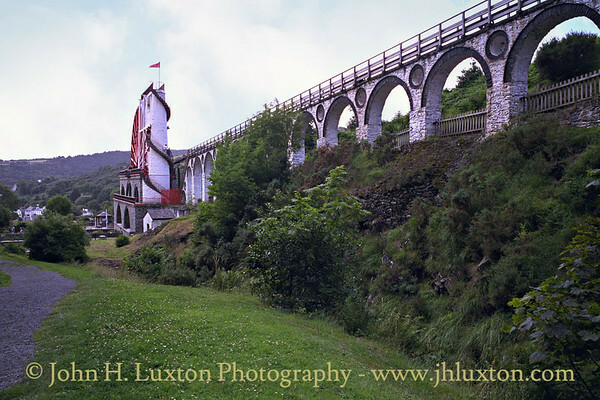 The Laxey Wheel (also known as Lady Isabella) is a large waterwheel built into the hillside above the village of Laxey in the Isle of Man. Designed by Robert Casement, the wheel has a 72-foot-6-inch (22.1 m) diameter, is 6 feet (1.8 m) wide and revolves at approximately three revolutions per minute. 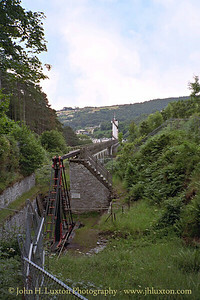 It was built in 1854 to pump water from the Glen Mooar part of the Great Laxey Mines industrial complex. Named "Lady Isabella" after the wife of Lieutenant Governor Charles Hope, who was the island's governor at that time. The wheel is currently maintained by Manx National Heritage as part of the Great Laxey Wheel & Mines Trail.